Shell wants to increase oil production from the Canadian tar sands by expanding its Jackpine Mine. The company says it can do so responsibly. But opponents resist the high pace of tar sands development, demanding stronger safeguards for health and the environment in northern Alberta. Seen from the air, the expansive oil sands region of western Canada looks like a wide swath of industrial activity in the wilderness. Enormous, angular plots of thousands of hectares have been shorn from the boreal forests of northern Alberta to make room for huge, dark pits surrounded by dusty roads, processing plants with billowing smokestacks, artificial mounds of excavated earth, and lakes of waste water. During a flight by bush plane between Fort McMurray, the boomtown of the oil sands in northeastern Alberta, and Fort Chipewyan, an indigenous settlement further north, the remote mining operations of the tar sands steadily pass by underneath. On either side of the Athabasca River are the large open mines of Canadian companies Suncor, Syncrude, Canadian Natural Resources Ltd. and Imperial Oil – and of Shell. 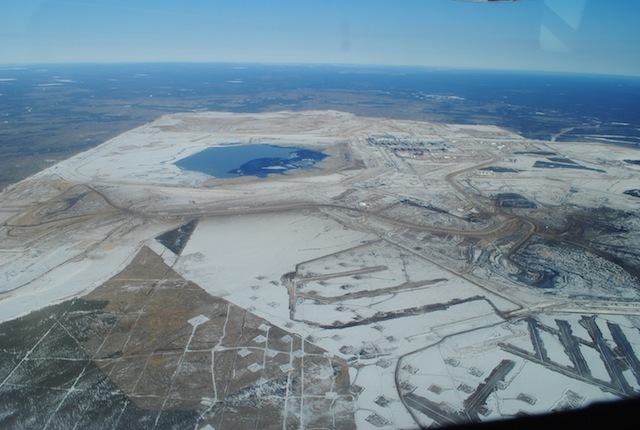 Tar sands mine from the air, with open pits (right) and tailings pond (centre). On the ground, the scale is no less imposing. 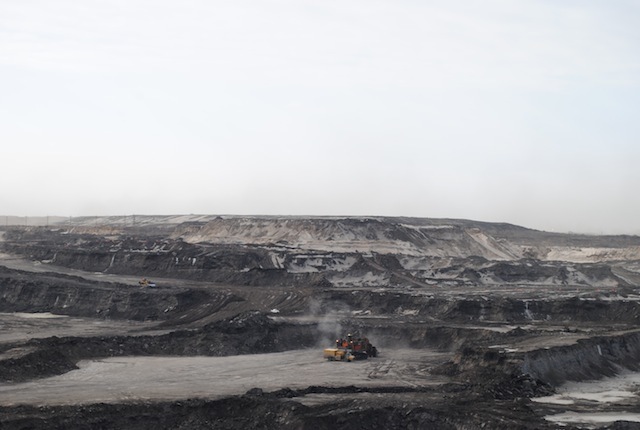 At the edge of Shell’s Jackpine Mine, a relatively new development in the region, the extraction process of tar sands from an open mine can be seen: excavators load tons of black soil into gigantic dump trucks. The trucks drive back and forth through the vast pit, to deliver loads of 400 tons of tar sands to a pair of crushers. From there, the raw material is transported by a large conveyor belt to the processing plant, where heavy oil is separated chemically from the sand. Shell is a leading player in Canada’s oil sands – and has plans to expand its production. A controversial proposal by the company to expand the Jackpine Mine by 2017 with a second pit and processing facilities with a capacity of another 100,000 barrels per day was approved by the Canadian authorities late last year. Shell still has to give the final green light for the expansion – a significant hurdle, given the reorientation initiated this year by the oil major’s new CEO, Ben van Beurden. While other projects worth billions of dollars, such as oil exploration in the Arctic off the coast of Alaska and fracking in the U.S. shale formations have been suspended by Shell because they are too expensive and produce too little result, expansion of the company’s activities in the Canadian tar sands is still being considered. The company views oil extraction from the tar sands as a form of energy production “strategically important for future growth”, says David Williams, spokesperson for Shell Canada in Calgary. A look at the scale of the tar sands operations makes clear why: with an estimated 170 billion barrels of recoverable oil, the Canadian tar sands are one of the largest oil reserves in the world, at a known location in a stable country, close to the main market for oil, the United States. Only the recoverable reserves of Venezuela and Saudi Arabia are larger. Due to high oil prices, the relatively difficult and expensive production process of tar sands oil is profitable – although the upfront investment costs are high. Tar sands oil production in Shell’s Jackpine Mine. International oil companies have been lining up for years to invest in the Canadian tar sands. Altogether, there are about 120 active projects in Alberta (both open mines and steam-driven ‘in situ’ recovery where oil deposits are deeper). In all, they produce about 2 million barrels of crude oil per day – a volume estimated by the Canadian Association of Petroleum Producers to rise to 5.2 million barrels by 2030. Since 2001, oil companies have invested about $160 billion (Canadian). In the next 8 years, another $200 billion is expected to be spent. The heady pace of oil sands development is met by increasingly fierce resistance, however. Opponents point to the negative effects of intensive exploitation on the environment. Tar sands operations are a major source of greenhouse gases such as CO2. Growing production runs counter to Canadian climate targets. According to critics in Canada and abroad, it is a step in the wrong direction if North America wants to achieve a greater emphasis on cleaner forms of energy. Opponents focus their protests specifically on proposed links to bring tar sands oil to market, such as the Keystone XL pipeline through the U.S. to transport crude oil down to the Gulf of Mexico, and the Northern Gateway pipeline to Canada’s west coast, for transport to Asia. The construction of the latter was approved this week by the Canadian government. In addition to their global dimension, the tar sands operations have a big impact on the landscape and water in the region. Thousands of hectares of boreal forest and wetlands are disturbed, with drastic consequences for the ecosystem’s flora and fauna. Large quantities of water are withdrawn from the Athabasca River for use in the production process. The artificial lakes of waste water on the leases of oil companies are simmering ulcers of toxins, including mercury. Scientists say these infamous ‘tailings ponds’ are leaking liquids into the groundwater. 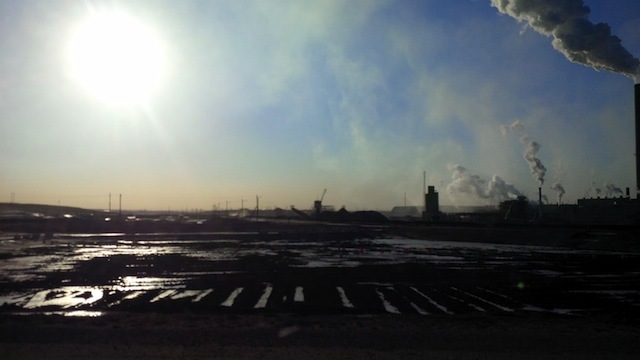 Oil sands fields at Syncrude, one of the industry’s pioneers, in northern Alberta. Hence, the tar sands have a significant impact on the traditional lands of indigenous people in the region, notably Dene, Cree and Métis. In Fort Chipewyan, an aboriginal community on Lake Athabasca downstream from the major oil sands mines, the growing development of the tar sands is watched with concern. The town of 1,200 people is on the front line of the tar sands industry. Ladouceur points to deformed fish in the lake as evidence that serious pollution is creeping in. “Our fish contains mercury, there are deformed pickerel and northern pike in the lake, they have big lumps on them,” he says. “People here like to eat fish because it is very healthy food – but not anymore because of chemicals.” Although a connection between the deformed fish and the tar sands has not been proven, residents have been advised to eat traditional food off the land in moderation. Fort Chipewyan on the shores of Lake Athabasca. Moreover, some critics say tar sands pollution is a direct cause of cases of cancer. 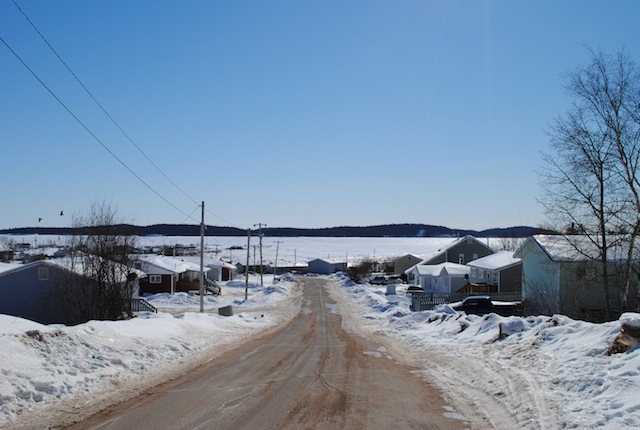 A relatively high number of cases of specific cancers in Fort Chipewyan, such as liver cancer, cervical cancer and the rare bile duct cancer, has led to unrest in the community. According to John O’Connor, a family physician in Fort McMurray who serves indigenous communities, people also suffer from skin ailments and breathing problems. That doesn’t satisfy the people of Fort Chipewyan – and they have received support from celebrities to draw attention to their concerns. Earlier this year, Canadian rock singer Neil Young went on a benefit tour to raise funds to help the Athabasca Chipewyan First Nation in its opposition to expansion of the tar sands. The proceeds of his concerts went to the legal defense fund of the First Nation, which is fighting a court battle against the approval of the expansion of the Jackpine Mine by Shell. They argue the approval goes against indigenous treaties and environmental laws. Shell points to extensive measures the company takes to mine the tar sands as responsibly as possible, in accordance with applicable rules. For instance, when it comes to water discharged into the Athabasca River, “none of that water has touched any oil sands”, says Zebedee. There is a detailed plan to return the area of the mine back to an ecosystem resembling the old one after the mining is done. That reclamation process is being carried out from the outset, says Fred Kuzmic, Environment Manager at Shell Albian Sands. 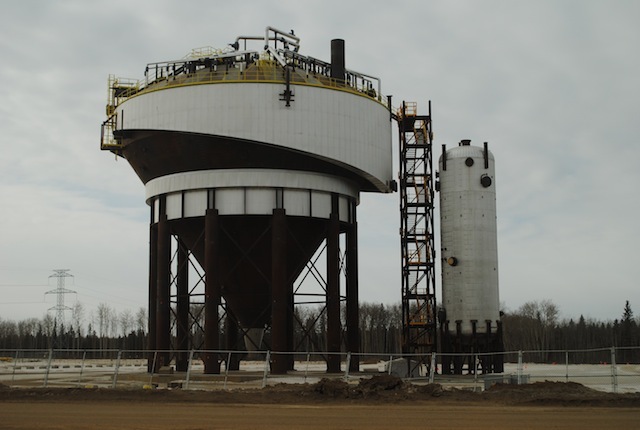 Installation for production of tar sands oil on Shell’s lease. The contrast between the industry and the indigenous population is not always as absolute as it seems. The tar sands sector employs thousands of aboriginal people. Indigenous communities in the region, such as Fort Chipewyan and Fort McKay, have established companies that provide services to the sector. Since 2006, Shell has spent $1.5 billion on deals with indigenous contractors.